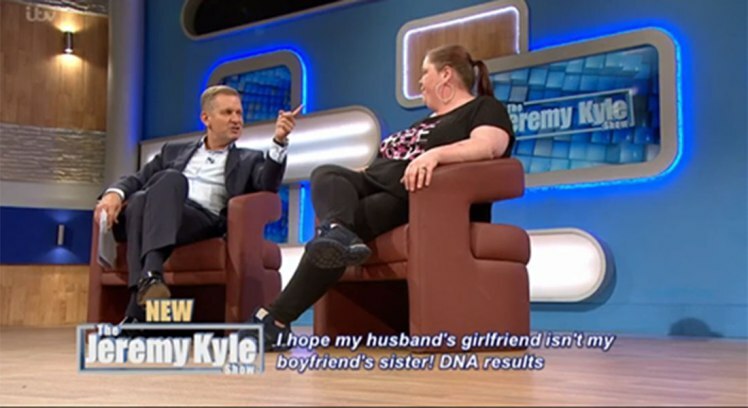 We’ve seen some pretty confusing titles on The Jeremy Kyle Show over the past few years, but none as confusing as this. Wednesday’s show featured a very confusing title that left us scratching our heads. The show aimed to sort out a very sticky situation between four people, Siobhan, Michelle, Chris and James. They needed to determine their relationship between each other through a DNA test. Which seemed like the usual kind of stuff seen on the show before. The title for their slot on the show was a big of a mind boggler. ‘I hope my husband’s girlfriend isn’t my boyfriend’s sister.’ I’ll just give you a minute to get your head around that. Unfortunately the story doesn’t get easier to understand at this point, but I’ll try my best to make it easier. So Siobhan and Chris were married for 8 years, the couple have a 5 year old child together, but the marriage eventually broke down and the two went their separate ways. Chris started to date Michelle, and Siobhan started to date James. However James may be Michelle’s half brother. That’s not all though! Siobhan and Michelle had previously been friends. Are you keeping up with this alright? "I hope my husband's girlfriend isn't my boyfriend's sister!" Even Jeremy was confused about what was happening with the show.